"This book gave me a lot of tools to help me stop dreaming about what I want to accomplish and actually DO it! For anyone who struggles with making the most of their day and needs somewhere to start, Deanna provides some very common-sense and “do-able” advice. I can’t wait to start implementing this advice to manage my time better!" “Juggle” is a common sense approach to time management, written in an amusing, yet concise way by Deanna Doss Shrodes. As owner of two home businesses, I had a couple of “DUH!” moments while reading this book and began following the principles immediately. I already feel a weight lifted from my shoulders! "Deanna Doss Shrodes has written a practical, simplified, easy to read approach to time management. I love the way she shares her many personal illustrations. She is so transparent. Her approach creates the feeling that it really is possible to better manage our time. This book will encourage the reader to get started. It is a book about hope and self leadership. It's a "make my day" kind of book. You won't want to put it down until you have read it cover to cover." "Deanna has written a book that speaks to its own topic. Not only is Juggle a book on time management that is easily readable in about an hour; the principles when applied could just as easily give one a 1000 fold return on that hour. Imagine what you would do with a thousand more hours in the next few months." "This book is time management at its finest. An easy to read guide with user friendly principles for anyone struggling in this area. The "Master Initiative List," is a God send; I intend to use it immediately!" The concise and easy to read, Juggle: Manage Your Time and Change Your Life by Deanna Doss Shrodes, will help you focus your time, keep you sane and dramatically increase your productivity. Her transparent sharing, of real life experiences, is inspiring and practical, while encouraging readers to protect their health and live their passion. Applicable to anyone, in any position, at any stage of life, I recommend you read it today! "Juggle is an amazing book! One that is easy to read, process and apply to my life immediately. As a mother to two very active boys as well as working and being in ministry, I felt a sense of renewed hope after reading this book. That the juggling act of successful time management does not need to be stressful and overwhelming , but CAN in fact be accomplished with your sanity still intact , by applying these profound yet simple 10 key principles. Deanna is very real and genuine in sharing her life experience and what it looks like behind the scenes to be a person that gets things done! All the while maintaining God as the number one priority, maintaining rest and relaxation as a necessity and having healthy relationships with others . Full of practical wisdom, humor,insight and truth 'Juggle : Manage Your Time and Change Your Life!' is a book I highly recommend and will keep going back to time and again." "I absolutely LOVE, LOVE, LOVE this book! It's just the right length for a busy professional and speaks to the Christian-based leader, so I most connected to the Biblical reference throughout.Professionally, I have been in a rut probably for the past 6 months and had lost the pizazz for my work as a resume writer and career coach. I felt undervalued and under-appreciated, and the compensation in my opinion didn't match the amount of time was putting into my clients. This book couldn't have hit my inbox at a better time to remind me of who I was and who I belong to. Around mid-year with the help of a speaker colleague, I picked myself up, dusted me off and decided to change what I didn't like about my current situation. Juggle re-cements for me, and the aspiring leader, that we weren't born to operate in "the average" but that Jehovah God created us to do exceedingly and abundantly ALL that HE has in store for our lives! Thank you for giving me the confirmation I needed right when I needed it most." "I always wondered how Deanna got so much accomplished. I would read her blogs and status updates and question if I were moving at all! There is certainly no grass growing underneath this woman's feet! In the past she would share nuggets here and there on how she stayed on task. Finally she shares how she does it all. This book is not like any other time management book or blog post you've encountered before. Deanna explores purpose and asks readers to find out the why. I love her initiatives list and will definitely implement this in my own life. Wonderful read. Will definitely help the busy get organized and manage their time in a way that pleases the Father." "I love when a book not only inspires you to want to make the changes it suggests, but also gives you the confidence to believe you can do so successfully with a few very practical steps! In Juggle: Manage Your Time and Change Your Life, Deanna communicates and coaches with a refreshing candor, sharing hands-on tools that, if followed, will have an enormous impact on your own time management abilities." "In this book Deanna has ingeniously depicted practical ways to provide greater productivity while eliminating unnecessary stress. If implemented as suggested, her strategies provide greater quality of life. These practical steps are applicable to men and women in every status of life. They will challenge you to apply these principles in order to eliminate time-stealers and enjoy success in accomplishing all you set out to do." Real Estate Agent/Broker, Florida Luxury Realty, Inc.
"It was no accident that at the same time I was dealing with some issues such as time management and boundary setting, this book was presented to me. I have a high respect for Deanna and, as a result, read her anecdotes and advice on living with an open heart. I encourage you, too, dear reader, to grab this book if you're feeling overwhelmed and don't know how to get it all done, much less where to start. I'll tell you where to start - start by reading this book!" "If you have ever longed to be more productive or wondered how to live a more organized life a reality then JUGGLE is a must-read! JUGGLE has inspired me to become a better manager of my own time and life. The strategies and wisdom from author Deanna Doss Shrodes for learning to manage time effectively are relevant, practical and proven." "I love this book! Without a doubt, this is the most user-friendly, realistic, and encouraging book on time management that I have ever read. Quite frankly, this has become my go-to resource for quickly realigning my own efforts and priorities. Deanna skillfully blends real life stories and Biblical truths with ten simple keys that anyone can take advantage of. These are some of the very principles that I have found to be critical to fulfilling the purpose and calling of my own life. "Juggle" is a refreshing and to-the-point book that leaves you feeling excited about approaching each day with a renewed confidence to tackle your goals and responsibilities. I am a firm believer along with Deanna that people who know God will accomplish and achieve. We were fashioned to imitate Him by working deliberately, with a sense of purpose, and with a resolve for excellence. The apostle Paul said, "But by the grace of God I am what I am, and his grace toward me was not in vain. On the contrary, I worked harder than any of them, though it was not I, but the grace of God that is with me." (1 Cor. 15:10 ESV) "Juggle" will teach you practical steps toward cooperating with the grace of God in your life and bringing glory to Him by accomplishing the special purpose He has designed for you." 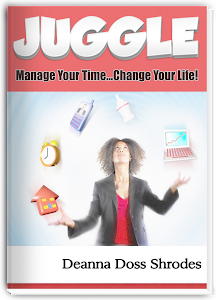 "JUGGLE is a quick, easy read loaded with practical application for time management. Deanna shares her personal experiences that seem to give you a green light for making decisions you've only thought of but were afraid to. I personally loved her insights on list-making -- and what woman doesn't need to make lists? I plan to implement her creative and yet very doable list processes." "Anyone acquainted with Deanna Doss Shrodes will instantly recognize her credibility to write a book about time management. JUGGLE is the culmination of an unending effort to make this earthly journey a "well oiled machine". JUGGLE offers a defined road map to navigate our fast-paced culture with more ease, and less stress. It's contents offer help to men and women alike, and should be required reading for teens." "This e-book is a must read if you are looking for tried and true solutions for your time management woes. This book offers applicable, step-by-step procedures in a concise format. It is a great, balanced read--motivational and yet practical. It's like having Deanna over for coffee and some face-to-face life coaching. Priceless resource!" "Deanna Shrodes has done it again! This book will allow the reader a practical guide for planning, prioritizing and pursuing their dreams. In a day of smart phones and tablets, where there is an app for everything, JUGGLE reminds us of simple ways to use the tools at our disposal to help us accomplish short-term and long-term goals. Deanna's personal observations and examples make it seem as if she is your personal life-coach sitting in the room encouraging you to your greatest good. Many people talk about having "too many things on their plate", as a the Administrative Pastor of Salem Missionary Baptist Church, I often have a lot on my plate and it sometimes seems the plate may be broken, chipped and possibly borrowed. Reading JUGGLE has reminded me of how to maintain excellence and integrity in my daily walk. By utilizing lists and determining the value and volume of the work before me, I can balance a full schedule without running on empty." "Deanna has the unique ability to blend education with inspiration and her new book Juggle accomplishes just that. In a style of writing that is both practical and personal, she will meet you in the middle of your daily life and invite you into hers. Each chapter offers real recommendations from a woman who is honestly producing more in a day than most of us produce in a month. Be encouraged that by applying one principle at at a time, you too can learn to juggle." "Insightful and encouraging, with a hands on approach to helping any woman in ministry as well as leadership." "As a co-pastor with my hubby I am always looking for ways to simplify my life. I also work full-time so managing my time and organizing my life in a way that assists me in completing ALL the tasks on my plate and remain sane are critical. Deanna's book is so practical and so right on. JUGGLE is a great read that will definitely change your life when you decide to apply the principles to your daily routine." "Time management made simple by someone who practices what she promotes and shares practical life applications, Deanna Shrodes. A definite read if you are looking for a resource that will transform your life!" "Juggle" brought to light so many practical and easy-to-apply steps to help organize and bring positive changes into my very busy life! I am excited to incorporate the "tested wisdom keys" presented by the author and enjoy the impact of implementing a plan that leads to maximum accomplishment with reduced stress. This e-book will be a worthwhile investment in yourself and your future!" "Deanna Shrodes cuts to the heart of the matter in Juggle. Who knew that it could be so easy? In just 10 simple principles, Deanna demonstrates how to manage your time and talents, to set up boundaries, to shed the false expectations of others, and become an efficient tool that the Holy Spirit can utilize, in order to achieve the purpose you were designed for. Her transparency will make you laugh or cry with every turn of the page, and the exposure to Deanna’s real-life situations will show anyone how to maximize your passion to achieve God’s plan for your life." "This book is valuable for anyone who feels the tension of multiple obligations. Many time-management systems leave an already stressed multi-tasker feeling even more burdened than they started out! In this book, Deanna Shrodes offers practical and realistic advice and gives us permission to prioritize what is actually most important." “JUGGLE not only provides real life solutions to managing and prioritizing your responsibilities it provides a reader-friendly guide to finding your purpose. Too many books on time management tend to, well, take up way too much of your time with academic theories, flow charts and complicated processes to follow. Combined with her life experiences, Doss-Shrodes introduces ten basic principles, designed to free you, not overwhelm you. “Juggle” also incorporates the important role spirituality plays it maintaining a more balanced life. Practical, useful and well delivered made this read not only beneficial, but very enjoyable. I instantly felt motivated…and less stressed!" "JUGGLE is not just a book that speaks of balance and planning, but challenges you to think differently about the time and life we all have been given. Deanna Shrodes writes with passion and a pointed perspective that has pushed me to go from being content with my time to being excellent."